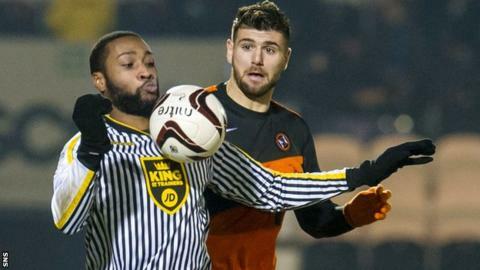 Dundee United manager Jackie McNamara refused to accept transfer speculation as an excuse for his side's performance in the 1-1 draw with St Mirren. The Tangerines missed the chance to reclaim third place in the Scottish Premiership and trailed to Kenny McLean's goal before drawing level through Stuart Armstrong. Gary Mackay-Steven has already signed a pre-contract to join Celtic for next season and Armstrong and Nadir Ciftci have been linked with moves away from Tannadice. "Was the speculation surrounding a few of the players an issue? I hope not," said McNamara. "That's something I can't answer. "But I thought the ones who have had speculation about their futures, especially Armstrong, was our best player tonight. "He got the goal but more than that, his running, his awareness, his tracking back - the little thing that people have questioned in the past - show me he is learning and that he is a fantastic talent. "GMS (Mackay-Steven) as well in certain bits of the game. "There's been speculation over them and Nadir too. He didn't have his best of games and I thought he should have scored at least one goal, but over the whole I don't think we can use the excuse of speculation." McLean, like his United counterparts, has been subject of transfer speculation and Fleetwood Town's attempts to sign the midfielder have thus far failed. "He's a talented footballer and for me it's only a matter of time before he does go," said Buddies caretaker manager Gary Teale. "I just hope for my own sake it is not until the summer. "He should be aiming at the Championship. I've played down there and for me he could walk into any of the sides in that division."